We are offcially back to work now. Though our new year sale ended, our flash sale is still on going. Please don’t hesitate to check regularly. The current flash sale will end in several hours, hurry up if you wanna grab any of them. Next round of flash sale will start from 00:00AM Feb 25 to 23:59PM Feb 27. Check the product list in advance. Here comes the new round of our flash sale. Product list as below. Ends at 23:59PM on March 2,2018. Next round of flash sale will start from 00:00AM March 3 to 23:59PM March 5. Check the product list in advance. Here comes the new round of our flash sale. Product list as below. Ends at 23:59PM on March 8,2018. Next round of flash sale will start from 00:00AM March 9 to 23:59PM March 11. Check the product list in advance. Here comes the new round of our flash sale. Product list as below. Ends at 23:59PM on March 11,2018. Next round of flash sale will start from 00:00AM March 12 to 23:59PM March 14. Check the product list in advance. Here comes the new round of our flash sale. Product list as below. Ends at 23:59PM on March 14,2018. Next round of flash sale will start from 00:00AM March 15 to 23:59PM March 17. Check the product list in advance. Here comes the new round of our flash sale. Product list as below. Ends at 23:59PM on March 17,2018. Next round of flash sale will start from 00:00AM March 18 to 23:59PM March 20. Check the product list in advance. Here comes the new round of our flash sale. Product list as below. Ends at 23:59PM on March 20,2018. Next round of flash sale will start from 00:00AM March 21 to 23:59PM March 23. Check the product list in advance. Here comes the new round of our flash sale. Product list as below. Ends at 23:59PM on March 23,2018. Next round of flash sale will start from 00:00AM March 24 to 23:59PM March 26. Check the product list in advance. Seems small vape pods are getting popular this year. 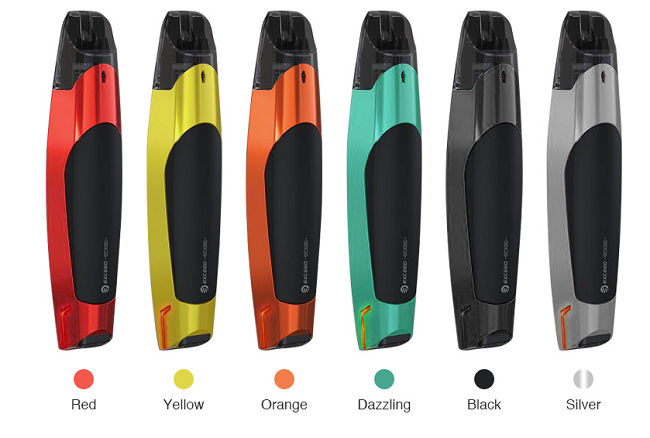 Just yesterday Joyetech released their first vape pod, called as Exceed Edge, which features a curved structural chassis with the shape of sports car, presenting in a compact size of 26.5110.020.0mm. The Exceed Edge consists of a 650mAh built-in battery and a 2ml refillable cartridge. The Exceed Edge battery comes with a huge fire button for easy operation, two LED taillights for battery indicator, and a micro-USB port for charging. Joyetech adopt a new EX 1.2ohm head in the Exceed Edge cartridge that can be easily replaced and bring you a top-notch MTL vaping experience with superior flavor. Moreover, it supports high nicotine and nicotine salt based e-liquids. If you are looking for a stylish and reliable tiny vape pod, the Joyetech Exceed Edge is definitely worth your try. Now it’s available for presale at US$21.7 with free shipping. The Joyetech Exceed Air is a new addition to the Exceed family, which is a 22mm diameter atomizer with 2ml TPD compliant e-liquid capacity. It features a detachable structure for easy cleanup and compact design for perfectly matching with most box mods in the market. Adopting the convenient push-to-open top refill system, the Exceed Air allows for quick and easy filling. It utilizes the EX series coil heads to offer you the original flavor of your e-juices, which include a 0.5ohm EX head designed for direct lung vaping and a 1.2ohm EX head perfect for mouth-to-lung inhaling. Moreover, this Exceed Air tank is equipped with a well-designed adjustable bottom airflow system that combines three small holes with one wide air slot, providing precise airflow for both MTL and DL vaping. No matter you are MTL vapers or DL vapers, the new Joyetech Exceed Air atomizer will surely bring you great vaping experience. With the popularity of vape pods these days, we can see many brands introduced small pod systems targeting those serious quitters. The Sikary Spod is such a new addition to this group. Different from other POD kit/mod, it includes a slick cigar-like Spod kit with 200mah battery capacity and a 2200mah Spod charging case for easy chargig and long standby time. And it features a replaceable 0.8ml Sikary pod with 2ohm resistance, which will deliver the pure taste of your e-liquid at a low wattage vaping. Plus the anti-leakage AIO pod design, stylish appearance and compact size, the Sikary Spod Starter Kit will lead you to a simple and efficient vaping world. The Sikary Spod Starter Kit will be available for presale at Buybest soon. Price will be updated later. Here comes the new round of our flash sale. Product list as below. Ends at 23:59PM on March 29,2018. Next round of flash sale will start from 00:00AM March 30 to 23:59PM April 1. Check the product list in advance. Here comes two new additions to the Vaporesso Cascade subohm tank series - the Cascade Baby and Cascade Mini, which inherits the same outlook design and good features of their predecessor but present in different sizes and tank capacities. The Cascade Baby is 24.5mm in diameter with 5ml juice capacity, while the Cascade Mini comes with 3.5ml tank capacity and 22mm diameter. Featuring the innovative isolation structure that separates coil and juice chamber, these two subohm tanks will offer you pure flavor at every puff and also reduce the possibility of dry hit. The Cascade Baby and Mini adopt convenient top filling system with safety lock design that effectively avoid accidentally opening of the top cap and leaking juice. They utilize GT mesh coil that brings great flavor and huge vapor together with the unique triangle airflow design. Moreover, they are also compatible with a variety of GT coils that support a wide watt range. 6 colors for your options. You can preorder the Vaporesso Cascade Baby & Cascade Mini Subohm tanks at Buybest now. Free shipping for each order over $20. Here we have a new compact vape setup on presale - the Avidvape Flag TC Kit, which is composed of a 2800mah built-in battery mod and a 2ml Flag atomizer. The Flag mod features a delicate and ergonomic body design with two color matching, giving an amazing visual feeling and comfortable grip. The 2800mah built-in battery ensures long working and standby time, supporting a max output power of 80 watts. The paired Avidvape Flag Atomizer is 22mm in diameter with 2ml tank capacity. It comes with a pre-installed 0.4ohm coil head and an extra 0.2ohm head to cater for your different vapor needs. Plus the unique resin drip tip, convenient top filling system and adjustable bottom airflow, this Flag Atomizer performs well at all points. Here comes the new round of our flash sale. Product list as below. Ends at 23:59PM on April 1,2018. Here comes the new round of our flash sale. Product list as below. Ends at 23:59PM on April 4,2018. We know Voopoo are quite well-known for their mod series, expecially the Drag. But this time, they seem target the atomizer market, releasing a subohm tank, called as Uforce T1, which combines the stylish steam punk style intermingling with modern technology. It’s preinstalled with a 8ml bubble glass tube but also comes with an extra 3.5ml glass tube. The Uforce T1 adopts push-open top fill system, making refilling is more convenient. Moreover, it supports multiple coil heads including U2/U4/U6/U8/N1/R1/D4 which will satisfy your vape needs at a wide watts range. Especially the single mesh coil N1, made of new material, will bring amazing flavorful clouds. The colorful resin drip tip also hightlight the appearance of this VOOPOO Uforce T1 tank. Overall, it’s a beautiful and versatile subohm tank for all vapers who wanna enjoy an outstanding vaping experience. We are now doing a 10% off sitewide Easter Sale, please don’t hesitate to pre order this VOOPOO Uforce T1 Tank with discount price. Here comes the newly released I-Priv Kit from SMOK, which inherits the eye-catching outlook design and great features of its predecessors, but also adds unique functions such as the latest accurate voice control. With such a high tech function, you don’t need bother to handle those complex adjusting procedures, which make vaping much more easier and intelligent. The Smok I-Priv mod is compatible with dual 21700/20700/18650 batteries, supporting a max output power of 230 watts. It also features a dial style screen that’s bright enough to display all vape data. Smok pair their famous Prince tank with this new 230W I-Priv mod as a full kit, leading you to a new vaping world. 8 striking colors for your choice. Now you can pre order this SMOK I-Priv Kit at Buybest.com. 10% off site wide during our Easter Sale, free shipping for each order over $20. Here comes the new round of our flash sale. Product list as below. Ends at 23:59PM on April 10,2018. Next round of flash sale will start from 00:00AM April 11 to 23:59PM April 13. Check the product list in advance. Speaking of Suorin, you might first think of their very popular vape pod, the Suorin Air. Obviously, this young brand mainly focus on introducing high performance pod systems which can be proven by their second release Suorin Drop and the latest release - Suorin Vagon. It’s a slim and ultra portable AIO kit, composed of a 430mAh built-in battery and 2ml refillable cartridge. The Suorin Vagon features a unique LED “V” shaped fire button and smooth curve design, making it pretty eye-catching and easy-to-use. Moreover, the bottom part of the Vagon battery is also amazingly designed as a pinned hook which allows you to pin it on your jacket or pocket for easy carrying. The Vagon cartridge can be is convenient to refill and supports a coil resistance of 1.1ohm- 1.2ohm, perfect for MTL vaping. There are 5 stylish colors for your choice. If you are looking for a reliable pod kit for smoking cessation or backup, this Suorin Vagon will be your dream girl. Please don’t hesitate to add this Suorin Vagon AIO Start kit to your shop cart if you like it. Price will be updated soon.